I have never seen anything so evil and twisted done in the name of science. Decades ago, and in some cases more recently, there was little regulation regarding what kind of experiments could be done, and which could not. True scientists have always known that you cannot kill someone in order to understand death, or something related to it. You could also never harm anyone, though exactly what qualifies as harm is always changing. For years, there was a huge patch of land in the desert that was a no fly zone. Outsiders were not allowed within its borders, and by some special handshake with the government, risked being shot if they trespassed. A bunch of politics happened that I had nothing to do with. We elected a new president, and there were some changes to our federal investigative system organization, which meant what was assumed to be a desert cult was no longer protected. Fearing something terrible, the military was sent in to raid the desert, not at all certain what they would find in the center of it. It turned out to be a pyramid. It wasn’t particularly large, but it was built with modern materials, and perfectly maintained. They forced their way into the facility, and discovered a relatively small group of researchers who acquiesced peacefully. All they asked was that their experiment not be disturbed, for it was extremely sensitive, and the introduction of new stimuli could result in severe psychological trauma. The soldiers went into the center rooms anyway, and found several teenagers living there. As per the warning, the kids were profoundly afraid of these new strangers. Upon being carried to the outside, they began screaming, crying, and thrashing about. At first, as implausible as it seemed, the soldiers thought they were dealing with vampires, they were do violent. But the researchers explained that they had been conducting a social experiment for the better part of two decades. The subjects were taken from supposedly unfit parents, who were rewarded substantially. I never heard how much money they were given for their children, or even whether it was true at all. All I know is that it is my job to help these kids acclimate to the world. They spent their entire lives inside the walls of the facility. They were told literally nothing of the universe beyond. They weren’t even told that there was a universe beyond. As far as they knew, the total breadth of reality topped out at around three thousand cubic meters. You can’t even imagine how bewildered they were when they were suddenly exposed to the dirt, to succulents, to the sun and the sky. They had no concept of these things, or frame of reference. They were taught the English language, but the researchers were exceptionally careful with what words they uttered. They said nothing that would even suggest the possibility there was more to the world than just this pyramid, and just this handful of people. It’s unclear what the researchers were attempting to accomplish with this. Perhaps they were intending to release them at some point, and observe their reactions. Or maybe they just wanted to see how humans behaved in a controlled microcosm. 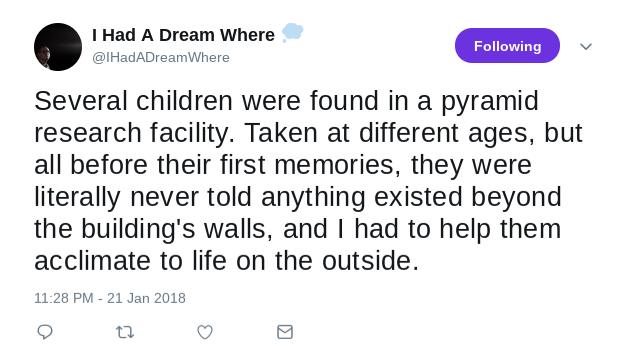 I have been told that there was little schooling in the pyramid. There was no use in teaching them agriculture, or animal names, or even that much math. As far as they could tell, everything would always be spontaneously provided for them, so they never thought to ask for anything else. Not a single one of them was so much as moderately suspicious that everything their elders had told them was just a lie. I don’t know how I’m going to explain everything to them, but I have been given the freedom to choose my own method of treatments, and move at whatever pace is needed. There is no time limit. Still, I see that the longer I take to prepare for them to survive without their elders, the harder it’s going to be to make any progress at all. I hope I don’t damage their vulnerable minds even more.